Spring 2019 Release: Soup To Nuts! Through the years, the term "soup to nuts" has somehow lodged itself squarely into my vernacular. It seems to sum up how I view Whetstone and what we pride ourselves on. The "soup" of the Whetstone story starts with these two wines for this release: Catie’s Corner Viognier and Pleasant Hill Pinot Noir. I have been working with these vineyards since 2002 when I was still under the Turley roof and first launching Whetstone Wine Cellars. In our case, the "nuts" of the Whetstone story may be when Michelle and I decided to jump all in and grow Whetstone together, build a life and dailiness around this business while raising four children…. But I digress. What happens next could not be possible without the care and thoughtfulness that goes into the collaborative preparation: attention to detail in the vineyard, great fruit, all eyes on the cellar, the gracious hospitality with our dream team at Whetstone, and the experience around your own table sharing Whetstone wines with friends and family. Charlie Chenowith planted and farms Pleasant Hill Vineyard. He has taught me a lot over the years about the subtleties of growing world-class, California Pinot Noir. Born and raised in Sebastopol, Charlie manages and owns hundreds of acres of storied vineyards throughout the Russian River and Sonoma Coast appellations. Pleasant Hill is planted in Goldridge loam soil, which from my perspective reads a bit like pound cake; well-drained soils tempered by foggy mornings, warm days and cool nights. Christine Magretts oversees all farming/business ops at Catie’s Corner Vineyard, where we get our Viognier. She and I have been working together since I founded Whetstone in 2002. The vineyard is planted in Goldridge loam soils riddled with river cobbles. Bi-lateral cordon pruning was established here to open up the canopy, expose it to more sunlight, and give the vines more stoke with less competition underground due to a less vigorous soil. I like to set a really big crop (think 7-8 tons to the acre) then throttle it back to 3-4 tons per acre with a rigorous fruit drop at Veraison. The Dutton family farms this place and is shepherding it into the barn with a level of quality our customers have come to expect. And speaking of the barn, Rebecca Laird owns and runs Laird Family Estate where I have been making Whetstone since 2005. With 50 years in the wine business, her family’s history and expertise, state of the art custom crush facilities and shared goals to produce great wines gives me a great home to make our wines. I take so much pride in watching these wines continue to shine and make their way into homes across the country. A big shout out to those that have been enjoying these wines for years and for first timers…….these wines are the foundation of Whetstone so we look forward to sharing them with you! Vineyard Notes: Sustainably farmed, cool climate vineyard site, Goldridge loam soils. Normal spring budbreak, fairly hot summer with record heat first week of September. Yield of 2.8 tons per acre; 2/3 clone 115 and 1/3 clone 667. Havested on September 8th. Winemaker’s Tasting Notes: Stainless steel fermented, aged for 16 months sur lees in 100% French oak; 35% new oak. Deep ruby in color. Bright, expressive nose of dusty raspberry, ripe Bing cherry, violets, and clove. Secondary notes of saddle leather and mint. Medium-bodied flavors of Bing cherry, ripe raspberry, orange pekoe tea and tobacco. Finishes long with bright notes of alpine strawberry and baker’s chocolate. Vineyard Notes: Sustainably farmed, cool climate site, river cobbles and Goldridge loam soils. Very rainy winter ending a string of drought years. September. Yield of 3.9 tons per acre. Harvested the grapes September 11th. Winemaker’s Tasting Notes: Barrel fermented in neutral French oak and aged for 16 months sur lees. Golden honey in color. Rich nose full of banana runts, guava, licorice, pineapple and orange rind. Background notes of jasmine and paper whites. Mouthful of ripe pear, orange cream-sicle, lime, liquid minerals, and peach liquor. Finishes long and bright with hints of lemon meringue, citrus and subtle tarragon. As for this harvest, 2018 will go down as the largest crop in the history of California grape growing. Despite the yields, the concentration and natural acidity of the wines in barrel run counter to what I figured might be the end result. Tickled on all fronts is what I feel as I put these wines to bed for the next 12 months. Fall 2018 Release: Misfits & Influencers! Michelle and I love to consume music. We have been fortunate that the universe has connected us with some of the best people working in the music business. The live shows at Whetstone are really an extension of what we do every day. It is always about the experience and how we connect with people. In an ever-changing industry, our story of struggle, lucky breaks, setbacks, perseverance and support from people who believed in us is what almost anyone can relate to. For me, successful musicians and winemakers seem to understand what it takes to monetize passion. Music is no different in degree of difficulty and lifetime commitment to your skill set. Also, I love understanding why people are who they are and what influences drive them to be/do certain things. In each of the books you get a full discourse on heroes and villains alike that shaped the artist. These books are for the workers, dreamers, lovers and loners, artists, freaks or anyone who wants to be baptized in the holy river of rock and roll. The folks that shaped me most begin with my grandmother Marguerite “Rita” Rodwell. I bused tables and washed dishes at her restaurant The Rice Paddy in Georgetown, SC during the summers beginning at age 10. She taught me the importance of Southern Hospitality and the art of being present. My first job and lucky break in the wine industry was driving a tractor and pruning old vine zinfandel for Larry Turley of Turley Wine Cellars under the direction of Ehren Jordan of Failla Wines. I garnered a ground level education in farming, along with a few life lessons and the opportunity to launch Whetstone. Christophe Morin and Jacques Seyssess from Domaine Dujac gave me a crash course in farming Pinot Noir in Burgundy and the importance of family. Jacques once said to me: "If it comes down to making 1000 cases less wine in exchange for being at all your kids’ games- do that." Fred Scherrer had a huge impact on me as a California winemaker & true Vigneron. He put Dehlinger on the map in 1994 and has continued to farm, harvest, and craft wonderful Sonoma Coast Pinot Noir under his eponymous label Scherrer. The finesse he employs in his wines while not being afraid of the abundant California sunshine is an art form that I aspire to. TASTING NOTES: Stainless steel fermented, aged for 10 months sur lees in 100% French oak; 20% new oak. Bottled unfined, unfiltered. Ruby red in color. Ripe nose of candied raspberry, dark cherry, and floral rose petal tea. Background notes of Bing cherry, freshly picked mint and tarragon. Medium-bodied, vibrant flavors of velvety plum and red berry fruits. Secondary flavors of ripe cranberry tea, cherry cola, citrus peel and hints of tobacco with long, ripe tannins and bright finish. BOOK PAIRING: "Born to Run," like Bruce, a crowd pleaser and true blue. TASTING NOTES: Stainless steel fermented, aged for 28 months sur lees in neutral French oak barrels. Dark purple in color. Expressive nose full of ripe red currants, savory red meats, black licorice and saddle leather. Secondary aromas of white pepper, bay leaf, cinnamon, and pipe tobacco. Intense flavors of raspberry, cassis and currants, with hints of baker’s chocolate and tobacco. Finishes long with velvety tannins and lively acidity. BOOK PAIRING: "Just Kids," like Patti, a bit more punk rock and just gets better with age. TASTING NOTES: Stainless steel fermented, aged for 16 months sur lees in 100% French oak; 35% new oak. Bottled unfined, unfiltered. Deep ruby red in color. Really big nose of alpine strawberry, rose petal, anise and clove. Secondary aromas of orange citrus peel, cayenne, and Mexican chocolate. Full-bodied flavors of ripe cherry, dark raspberry, and blueberry pie. Luxurious, long finish with flavors of dark red fruits and baker’s chocolate framed by soft tannins and mild acidity. BOOK PAIRING: "My Life Inside Rock And Out," like Bill, a class act all the way. Crack a bottle, grab a book and enjoy! You will be the focus of ridicule and wild speculation as to your lack of knowledge on the subject…until they taste it. P.S. Don't forget to pair it with the 2014 "Pleasant Hill" Pinot Noir! Share the spirit of Whetstone! H a n g t i m e . . .
To my 10 year old, Watson, this term is used in reference to old videos of Michael Jordan launching a dunk from the foul line. To my 17 year old, Sterling, it is simply a path to the next hold while rock climbing. For me, hang time for our fruit means phenolic ripeness in all its many facets. The heat spikes we experienced this summer were unparalleled and drove sugars sky high without the requisite softening of tannins and respiring of acids...until mother nature pumped the brakes for most of August. We were very fortunate to have harvested all our grapes before the fires began with our last pick of Syrah coming in on October 5th. Another wave of heat coupled with 50 knot winds on the night of October 8th proved to be a recipe for the disastrous fires here in Napa and Sonoma counties. With the smoke cleared, blue skies and fresh air have returned to our lovely home here in Wine Country. We remain in awe of the strength of our community and grounded by the simple pleasures of hang time with family and friends. We are harkening back to a staff-favorite: our 2012 vintage! Having just opened a few bottles, these wines are starting to come out of their infancy. I'm impressed by the way they are taking on weight and nuance as they loosen their grip on the vintage with more structure and a bit more tannin. When we think of the holidays, we think of Pinot Noir here at Whetstone. So we're offering you a fun way to take a trip through the Sonoma Coast Appellation with our 4-pack of 2014 single-vineyard Pinots! Starting from the Petaluma Gap all the way up to Annapolis, each vineyard has a unique topography and micro-climate that translate directly into your glass. Need a little Southern charm in your life? 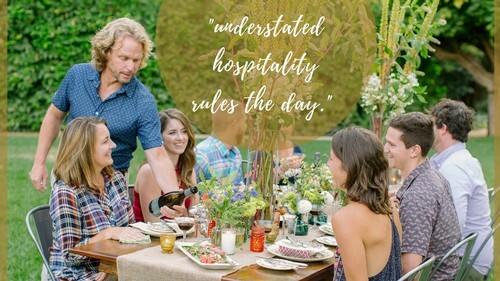 Our famous Fried Chicken Supper is featured in this stunning table top book: Napa Valley Entertaining, by Blakesley Chappellet, with photographs by Briana Marie. In addition to the people and places, this recently published gem artfully highlights the true beauty of food, entertaining, and hospitality. To make it even more charmingly Southern, we are including a bottle of our 2014 'Jon Boat' Pinot Noir! Cheers to some quality hang time with family and friends this holiday season! C a n I j u s t s a y . . .
How awesome it is to walk into the garden in our backyard and grab some arugula, butter lettuce, or romaine for a fresh summer salad; pimientos for a cast iron skillet; cucumbers for 24-hour pickles; or a variety of tomatoes and fresh basil?! For me this is the perfect balance of abundance and simplicity that Michelle and I seek daily. This rule applies not only in our home and at the chateau, but in the vineyards as well. My approach to farming aims to strike that same balance between abundance and simplicity. And I attribute it to where we are today. The 2017 vintage looks to be 2-3 weeks later than 2016 with a slightly above average crop load. The vines are green and healthy due, in part, to all of the rain we received this past winter. Fruit set was optimal across the board and clusters are as they should be with no shot berries and very few instances of hens and chicks. And finally, the tasting notes here at Whetstone are done by committee as the girls and I take a seat together late morning and discuss smells, flavors, nuances...everything. Addie, who has been with us since the beginning, has an unparalleled (and unbridled) ability to take the abundance in the glass and translate it into layman's simplicity. Her quote at the end of the 2014 Syrah: "Like a giant field of lavender with a bull running by on a hot day"...brilliant! S o w i t h o u t f u r t h e r a d o . . .
TASTING NOTES: Stainless steel fermented, aged for 16 months sur lees in 100% French oak; 35% new oak. Bottled unfined, unfiltered. Ruby in color. Big nose of rose petal, sweet perfume, cherry and bay leaf. Medium-bodied flavors of red raspberry and cherry cola with hints of pekoe tea and Asian spice. Lingering flavors of black cherry, tea and baker’s chocolate with a hint of tobacco accentuate a textured, long finish. TASTING NOTES: Stainless steel fermented, aged for 28 months sur lees in neutral French oak. Dark purple in color. Nose jumps out of the glass with ripe cassis, freshly crushed pink peppercorns, violets and “animale.” Secondary aromas of red meat, white pepper, beef carpaccio, and camp fire. Intense flavors of cassis, ripe raspberry, white pepper, and savory red meats. Finishes long with fleshy tannins and tobacco. Aged 16 months in 35% new French oak barrels, sur lees. Deep ruby red in color. High-toned notes ripe raspberry perfume, rose petal, and Bing cherry with hints of thyme and mint. Secondary notes of toasted brioche with butter and strawberry jam. Silky, rich flavors of Bing cherry, orange pekoe covered dark chocolate, and Asian spice. Finishes long with bright notes of sassafras tea and baker’s chocolate. Barrel fermented in neutral French oak and aged for 16 months sur lees. Golden yellow in color. Bright nose full of apricot, lemon and orange marmalade, with hints of licorice and thyme. Background notes of jasmine, paper whites, hazelnut and toasted almond. Mouthful of apricot, liquid minerals, and peach liquor. Finishes long with hints of lemon meringue, white peaches, and touch of salinity. Aged for 16 months in 35% new French oak barrels, sur lees. Cherry red in color with a big, bright nose of bing cherry, red currants, forest floor, mushroom, and Asian spice. Secondary notes of rhubarb pie, nutmeg, pumpkin spice, and tea. Medium bodied flavors of red plum, bing cherry and baker’s chocolate. Finishes super long with notes of orange pekoe tea and a hint of tobacco. Off to an early start, the 2015 growing season had some fits and fizzles through the spring followed by one of the longest sets in recent memory; as in 28 days long! Summer had some hot pockets but then slowed down considerably, ripening the fruit almost perfectly with some great acids. The size of the crop was quite a bit shy of a normal yield averaging around 2.2 tons per acre. Pleasant Hill Pinot Noir and Catie’s Corner Viognier continue to offer up pleasurable wines that stay rooted in finesse and varietal. The Terra de Promissio Pinot Noir looks to be a perfect wine for aging that puts more of its heel into Burgundy than its toe. Summer Concert Series: Michelle has some amazing talent lined up, so get ready to sip & rock it out on the lawn! Annual Harvest Party: August 20th! Mark your calendar. so make sure you check our "Upcoming Events" page! Magnum Add-On Offer: Add these beautiful, hand-waxed bottles to your Wine Club shipment today! Sign up for our Magnum Add-On offer to receive a limited-production format of each new wine per release. 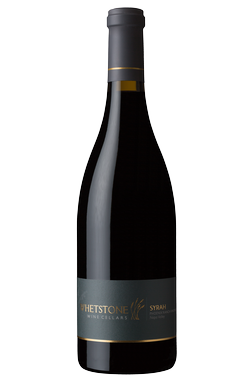 Pinot Enthusiast Club: Enjoy a mixed case of Whetstone's Pinot Noir each release! Join now. Key ingredients when making the finest Lowcountry Hoppin’ John! Thought to bring luck and prosperity in the year ahead, this heartwarming dish is a classic Southern tradition that my family continues to keep alive. Today, more than ever, it’s just nice to sit back and enjoy a simple meal that dates back generations. The fact that I order heirloom rice and beans directly from Anson Mills in South Carolina to create this tradition for my family across the country in California speaks to the same values that make what we do at Whetstone so special. The attention to detail we enjoy with our growers, the way we welcome you into our home at the Chateau, and the delicious consistency of our wines are a passionate and measured existence. 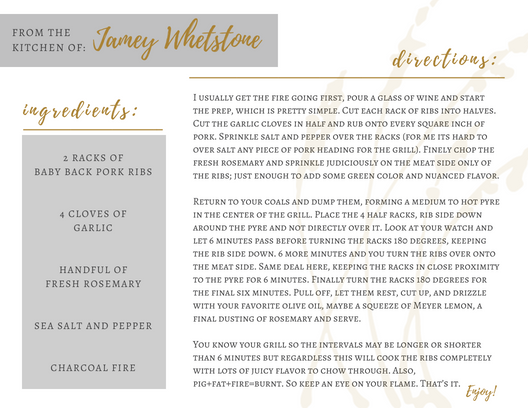 We hope you find it all translates into lots of comfort while sipping your favorite glass of Whetstone as winter gives way to spring. Whatever your tradition may be, it's our hope that Whetstone wines have - or perhaps will - become a part of it! H a v e y o u e v e r h a d a s l i c e o f p o u n d c a k e ? As a kid it was a mainstay around the holidays and, really, anytime we were celebrating. Just the thought of it makes my mouth water...how I love that dense and spongey sweetness! Speaking of density, the Goldridge Loam soil series replete throughout the Russian River Valley always reminds me of pound cake! Not only in its makeup and consistency, but also in how it allows a vine to enjoy a luxurious and less stressful existence below ground. It's what happens above ground, however, that gives the many nooks and crannies of the appellation an opportunity to imprint a special sense of place, like what you experience in our beautifully expressive Pleasant Hill Pinot Noir. The Pleasant Hill vineyard, planted and maintained by Charlie Chenoweth (a dear friend, mentor, and one of the premier farmers of high-end Pinot Noir in California) has been a single-vineyard designate for Whetstone since 2003 and serves as the foundation of our newly-expanded Pinot program. The 2013 vintage marks a decade of working with this flagship vineyard and what a better way to celebrate it's history than to share it with you?! P I N O T f o r f r i e n d s a n d f a m i l y ! ! ! " With so much to celebrate this time of year, you don't want to find yourself empty handed! Cheers to p o u n d c a k e & p i n o t ! Fall Release // News, Updates & Thanks! As I sit here on the dock, smoking the last of a Hemingway and watching a big moon rise up over the western shore of Lake Tahoe, I am acutely aware of the art of being present. It is an art form that I’ve practiced with each bottle, tune, and conversation shared under the sun at the chateau with many of you this summer. I mean, let’s be honest...delicious food, summer concert series, bare feet, and blankets on the lawn are what summer is all about here at Whetstone! And nobody is better at setting a beautiful table and filling its seats with the best of company than Michelle. When she first came up with the idea of Fried Chicken Fridays, we all agreed it was brilliant, but I don’t think any of us realized what a hit it would be! These monthly gatherings in addition to our summer concerts and Harvest Kick-Off party have provided such a wonderful sense of community with our local supporters, industry friends, and neighbors alike. Thank you to all who attended any number of our summer fiestas, enjoyed a classic tasting under the oak tree, or gave Ace a belly rub – your continued support and friendship mean so much to us! As much as we hate to think about summer coming to an end, the cooler weather really only shifts the parties fireside and brings my focus squarely to harvest. My daily visits to the vineyard offer me even more practice in being present as I leave my phone in the truck, grab a swig of coffee, take a deep, lung-filling breath of crisp, early morning air, and commune with the vines. So far, 2016 has provided a very warm spring and solid set, followed by a hot June and warm July. It's looking to be another semi-early harvest with below average yields, which should bode well for concentration of fruit with bright, natural acidity. Lots to look forward to! H E R E & N O W .
Stainless steel fermented, 100% French oak-aged in 20% new oak barrels. Bottled unfined, unfiltered. Ruby in color. Complex nose of dark cherry, blackberry pie, orange peel, and pekoe tea. Background notes of rose petal and Asian spice. Bold flavors of Bing cherry, dark cherry with hints of sassafras tea. Secondary flavors of pekoe tea and plum with supple tannins and long, bright finish. SIDE NOTE: While the 2015 "Jon Boat" Pinot Noir is currently raring to go, it will certainly reward those of you who have the patience to put away a case or so for the future. Aged for 28 months in neutral French oak barrels, sur lees. Dark purple in color. Large nose full of dark red cherry and cassis, bacon fat, and red meats with hints of what the French describe as "animale." Secondary aromas of hi-tone blueberry and wafts of garrigue. Velvety mouthful of red plum with lots of rugged cassis, Asian spice, and white pepper. Finishes long with plum, red meats, ripe tannins and a hint of Swisher Sweet. Stainless steel fermented. Aged for 16 months sur lees in 35 % new French oak barrels. Bottled unfined, unfiltered. Darker shade of ruby in color. Big nose of candied red fruits, watermelon Blowpop, bay leaf, and hints of rose petal. Ripe, big flavors of pomegranate, red cherry pie with lots of tea and rose hips. Silky, long finish of hints of plum and tobacco. SIDE NOTE: Located in Annapolis, this vineyard sits high on a knoll where you can see the Pacific on a clear day. At the far northern reach of the Sonoma Coast, it's a warm spot in a cool climate and allows me to express yet another facet of this huge AVA. While they're showing beautifully now, these wines will be sure to blow your mind in years to come. So don't forget to practice a little patience (in addition to presence) today and always. **"Cornas" is a Northern Rhone town where, for me, the greatest Syrah on the planet is grown. My heroes run back to Aguste Clapp, Noel Verset, and - over the past 16 years - Thierry Allemand. The place wreaks of the exotic animale, white pepper, cassis, and violet that I crave on a many blustery, Christopher Robbins days of fall. Cassoulet is my dish of choice with all things Cornas. Spring Release News & Notes! Welcome back all you Whetstoners! How's the weather you ask? Rain, rain, rain then lots of glorious sunshine! We are enjoying the precipitation that has been crucially lacking over the past 4 winters. It really hit home as Michelle and I drove to the top of Donner Pass and down towards Tahoe City... SNOW!! Needless to say, it’s a wonderful sight and will truly come to bare over the '16 growing season. What a PLEASANT vintage 2014 was in both quality and quantity! These wines will be long lived and cellar well with plenty of fruit, silky tannins, and finesse. We're excited to be announcing the addition of the Terra de Promissio Pinot Noir this release! Owned by Charles and Diana Karren, she's now overseeing the vineyard after retiring from the world of finance. Historically, I have put this fruit into the Jon Boat Pinot, but beginning with the 2014 vintage and going forward it is all SVD (Single Vineyard Designate)! It sits just south of the Petaluma airport and Petaluma Gap, and is a wonderfully sloped, southern-facing vineyard that will only get better as time goes on. D R U M R O L L P L E A S E . . . This Pinot sure isPLEASANT! Aged 16 months in 35% new French oak barrels, sur lees. Cherry red in color. High toned floral notes of citrus tea, rose petal, cola & Bing cherry. Secondary notes of vanilla, sassafras tea, & mint. Silky, rich flavors of Bing cherry pie, tea, soy & baker’s chocolate. Finishes long and velvety with fine tannins & hints of tea & spice. Barrel fermented in neutral French oak and aged for 16 months sur lees. Golden yellow in color. Big, ripe floral nose of Meyer lemon, kiwi, jasmine, pine & apricot. Background notes of bees wax, licorice, & liquid minerals. Mouthful of apricot, Meyer lemon & key lime give way to a long, lingering finish. Aged for 16 months in 35% new French oak barrels, sur lees. Cherry red in color. Floral notes of sassafras, rose & Rooibos tea with hints of Asian spice. Secondary notes of orange peel, forest floor & tobacco. Bright flavors of red plum, ripe cranberry & orange pekoe tea. Finishes long & refined with notes of bing cherry, tobacco & baker’s chocolate. S H O P N E W R E L E A S E S N O W!